All English courses above the 100-level are taught by faculty who have a PhD or other terminal degree. 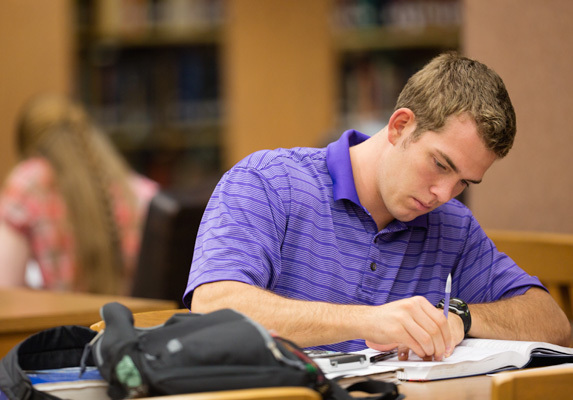 Studying English at BJU is more than just reading books and writing papers. It’s about understanding cultural history, thinking critically and communicating clearly. All these skills are essential for many careers and vocations—especially for Christians who desire to influence the world for Christ. In our English program, you’ll explore the uniqueness of humankind through various points of view and cultures, and you’ll learn to better understand the people around you. Throughout the program you’ll build a solid foundation in classical, British and American literature and explore the structure of the modern English language—all from a biblical worldview. Your faculty will challenge you both academically and spiritually by weaving scriptural wisdom and faith-building perspectives into their courses. BJU’s English program offers a uniquely biblical approach to the study of the English language and literature. You’ll lay a solid foundation in aspects of language such as phonology, morphology, syntax and semantics, and learn how to apply your knowledge of theory so you’ll be able to communicate clearly and effectively. In both reading and analysis, you’ll learn how to respond biblically and realistically to literature and how to make decisions concerning censorable elements. In so doing, you’ll develop discernment not only in what you read and how you read it, but also in how a Christian should approach the world at large. Even more importantly, your studies in interpreting and appreciating literature will aid you in your study of the Scriptures. Essential to effective communication is understanding. That’s why at BJU you’ll take courses that help you understand humanity—people’s needs, their motivations, their interests and so much more. Courses in history, the fine arts and the sciences will help you connect with others and help you build relationships for God’s glory. Additionally, your Bible courses will help you know what you believe and why you believe it, as you grow in grace and in the knowledge of God. The English program gives you a lot of flexibility to take elective courses in a broad range of fields. Courses in communication, business, cross-cultural service and theatre supplement your studies in literature and the English language. Because several of these fields include courses required in the English program, you can easily develop your elective courses into an academic minor, such as Teaching English as a Second Language (TESL), theatre arts, journalism, business or a foreign language. I commend BJU’s English program to anyone who wants to become a better reader—of the Bible, of other great literature, or even of the newspaper—and a better writer. And I commend the program to anyone who wants to enjoy his coursework and sit under professors who know their subject and love their students. I chose the bachelor of arts English program at BJU to gain a foundation in the liberal arts before entering seminary. Two of the most important skills for the ministry—the ability to read with care and understanding, and the ability to communicate clearly and honestly—are firmly fixed emphases in every English course at Bob Jones University. From the ancient and medieval periods to the 16th Century, from British literature to American, every course required me to hone my aptitude for receiving whatever the text actually said and then distilling that understanding into compelling, clean-edged writing. After completing my English degree, I continued on for a master’s degree in Bible translation at BJU, followed by a doctorate in linguistics from The University of Texas at Arlington. In both programs I found myself well prepared for my Bible and linguistics classes, and ultimately for writing a dissertation, because of the capacity I had developed in my English degree for analysis and synthesis, for making clear arguments and writing crisp prose. An English degree at BJU opens up a variety of employment opportunities to you. Essentially, you can pursue any field that relies on skills in communication and analysis. Our graduates have gone into careers in business as writers, human resource personnel, managers and analysts. Others have found employment in academia as professors, librarians and administrators. Some have gone into graduate work in literature, linguistics, journalism and law. And still others have entered cross-cultural ministries such as missionary work, Bible translation or teaching English in a foreign country. BJU offers students a variety of ways to network with employers and organizations. A multitude of job opportunities are posted each year on Career Central, our online job board. In addition, over 60 businesses and 150 Christian schools/mission boards/Christian organizations come on campus to recruit students through on-campus interviews and job/ministry fairs. Career Services also helps students by holding seminars on resume preparation and interview techniques. As a student at BJU, you’ll have access to a huge selection of research materials in our library. We provide the JSTOR database, a digital library of academic journals, books and primary sources; a microfilm collection of early American newspapers; and the MLAIB database, which indexes scholarly books and articles on modern languages, literatures, folklore and linguistics. In other words, we’ve got plenty of resources for you to use for your research. And if we don’t have what you need, our library participates in a book loan program, and we’ll even order books on occasion if you request them. You’ll have the opportunity throughout the year to attend both the English forum and the creative writing forum. In these forums, graduates and professionals share their experiences and give advice on wisdom they’ve learned during their careers. From the guest speakers, you’ll get a great inside look into the worlds of English and creative writing. Not only do you get to study great works of literature, but you also get to experience many in action. Through our Concert, Opera & Drama Series and numerous student plays each year, you’ll watch characters from works like Pride and Prejudice, Great Expectations or Romeo and Juliet come to life. There are also many acting roles open to students, including understudy positions for the lead roles, so you can even experience these works of literature for yourself. Regardless of how you choose to enjoy the productions, you’ll learn how various media bring out different qualities in stories, including the strengths and weaknesses of the written word. Our faculty members who teach 200- to 500-level English courses all hold a PhD or other terminal degree. They come from various backgrounds and specializations in diverse literary fields and others, such as Bible. They’ll help you navigate the world of ideas and provide you with a solid foundation in scriptural principles. Analyze knowledgeably a range of literature from different eras and cultures. Compose effectively in multiple literary genres. Produce writing that is grammatically appropriate and stylistically effective. Exhibit a biblical worldview when evaluating literature or producing works of creative written expression. Prepare a manuscript for publication according to professional standards. Analyze, interpret and evaluate literature within a framework of biblical understanding. Write an effective literary-critical essay utilizing library resources. Analyze audience and situation to create documents that meet rhetorical needs. Apply language conventions and effective organization to written discourse.